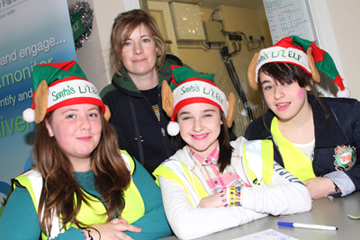 THE Drumaness Youth Council are delighted at the support they received for their Christmas Community Event. Young people from Drumaness Youth Council were overwhelmed by the support they received from local people for the roll out of their Christmas Community Event on Saturday 8 December in the Dan Rice Hall, Drumaness. The event was organised in association with Down Policing and Community Safety Partnership. Lise Curran, County Down RCN Health Development Worker, with Santa’s Little Elves Nicole Drake, and Chloe and Jade McMeakin. People attending the event enjoyed free burgers and chips, a children’s disco with facepainting, a tombola and a wide range of Christmas stalls. The day concluded with a showing of the Christmas classic, ‘It’s a Wonderful Life’ throughout which young people served tea, coffee, biscuits and popcorn. Santa was a huge success, with a huge number of young people visiting to hear about his plans for Christmas eve and what they hoped to see under their own trees on Christmas morning. All money raised on the day will be donated to support a number of good causes including Cool FMs Cash for Kids Appeal and the Hands for Alfie Appeal. 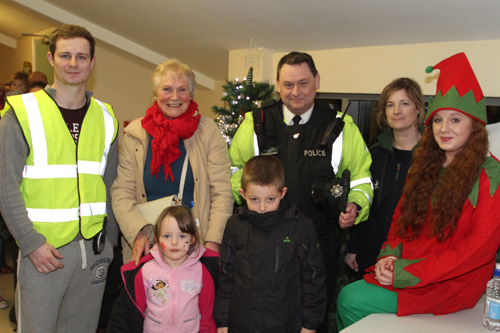 Pictured at the Drumaness Youth Council’s Christmas event are Dylan and Kerry McTeer, Constable Alan McGregor, Lise Curran, County Down RCN, and some of the young supporters of the Drumaness Youth Council.